Excuse my silence, but these sticky hands have been busy processing cherries. Remember that pick-your-own excursion that got me slugging 40lbs of cherries home? Well, yes, we needed to pit every. single. one. and do something with the cherries. Whew! You don’t have to visit that farm stand to get one for your home! Click here to buy. Take a close look at this brilliant design! No cramped hands with that spring-loaded push button. The action of pushing is faster than squeezing, so I really ploughed through a tray of cherries in no time. 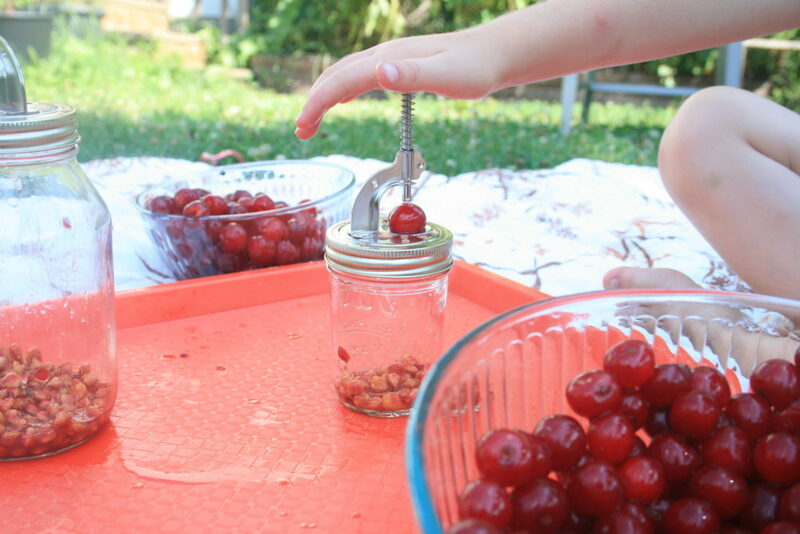 In the mason jar lid, there is a little divit or tiny funnel that the cherry easily slides into, with a hole in the bottom for the pit to push through. The clean-up couldn’t be easier as it collects the pits right into your mason jar. The fast and exact action of the rod pushing through the cherry significantly reduces squirting juice, too. Set the cherry on the lid, push, place cherry in bowl (or mouth). It really is extremely simple to use, so remember to buy one for that little helper, too. It would not take much convincing to persuade your three-year-old that pitting cherries is more enjoyable than tearing all the books off your shelf. So what did we do with all these cherries? I didn’t do any fancy canning with them. These cherries are of the tart variety, but are still sweet and so delicious in their own right, I kept it quite simple. 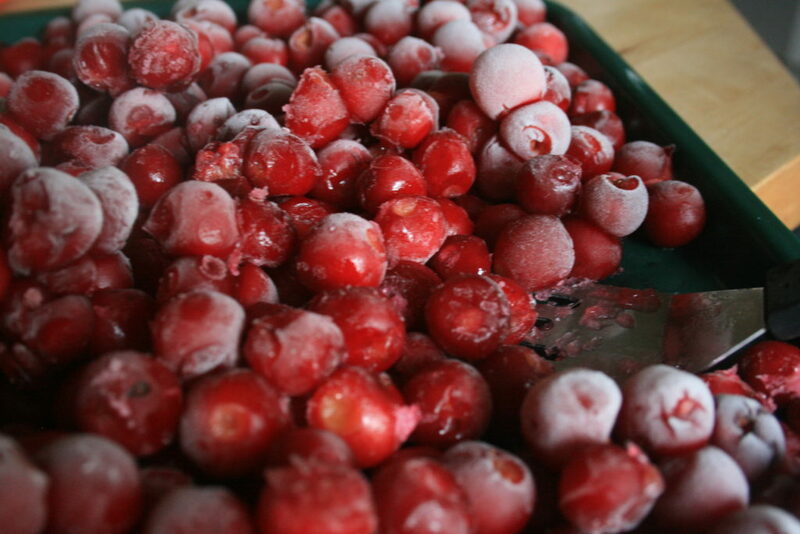 After pitting them, I popped a couple trays of just one or two layers of cherries into the freezer. 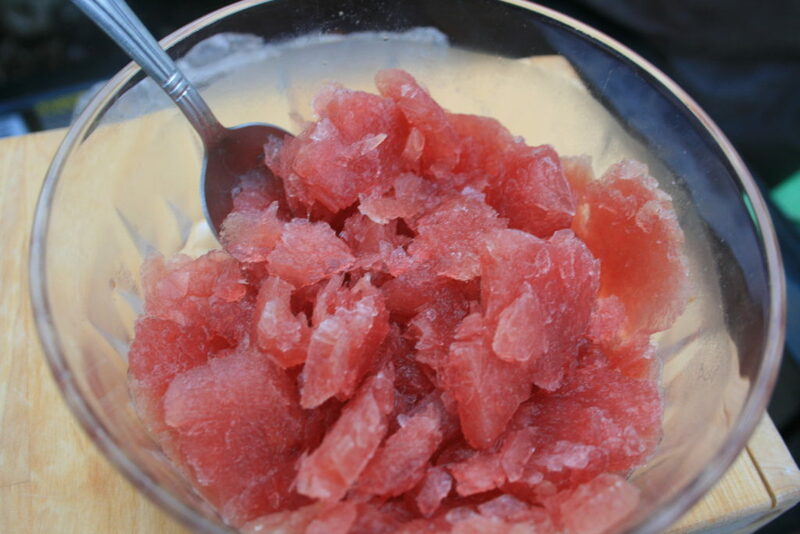 This way, they freeze as individual fruits instead of in one huge clump. After they are frozen, I move them into gallon bags that I can easily scoop from when I’m baking and cooking. Score three one-gallon bags of frozen cherries for the freezer! This will provide us a sprinkling of cherry clafoutis and cherry almond biscotti throughout the year, plus enough for some creative concocting. 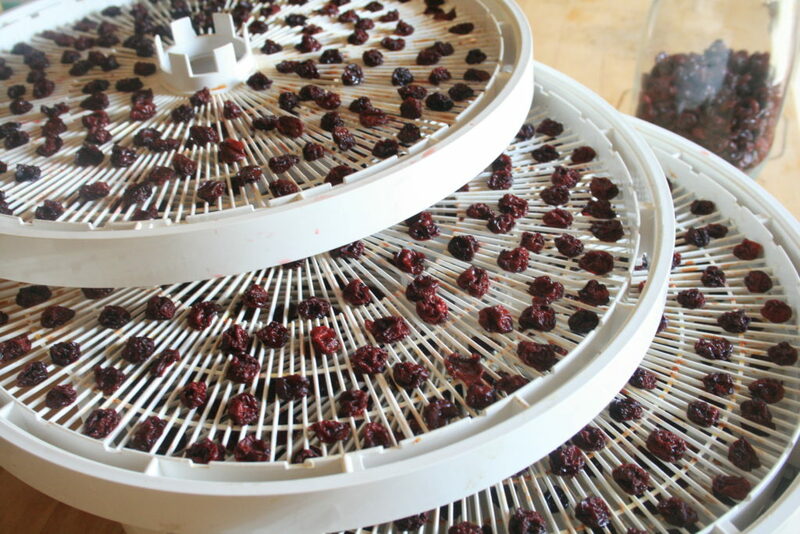 A couple quarts of cherries landed in some brandy to become a delicious liqueur, and many trays of cherries went through the dehydrator because we LOVE dried cherries in our trail mix. A fruit and nut mix is a staple in the diaper bag, car, every hike, and pretty much everywhere. Cherries are a rare treat in our mixes because they fetch a much higher price than raisins. After pitting all of these, I understand why! As I processed all these cherries, I collected juice drippings along the way. It added up to be a substantial amount of just pure cherry juice, so good! Our last week here has been really hot, so this juice landed in the freezer to be made into icees and popsicles, without all that added sweetener and color, thank you. Do you prefer to buy/grow sweet or tart cherries? What is your favorite way to use up a bucket of cherries?